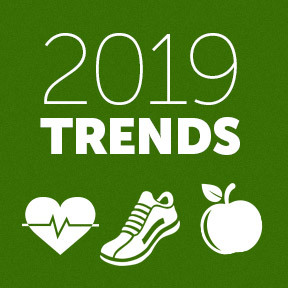 In the health, wellness and nutrition world, there’s a lot of interest in what’s trending for the new year, while the prior year’s predictions that didn’t make the cut simply fade away. For every trend or wellness product that is actually helpful, there are many that don’t even come close. While not everyone knows that dairy cows are sweet gentle animals, “cow cuddling” therapy sessions haven’t really caught on. Goat yoga apparently still has some followers, although some yogis found that having goats climb onto their backs while attempting a pose was incredibly distracting from the mindfulness intentions of yoga. While some trend watchers follow gimmicky celebrity advice, appetite suppressant lollipops are likely not a sustainable way to lose weight. Which ideas, diets and products are forecasted to trend 2019? The Natural Grocers Top 10 Nutrition Trends list for 2019 includes green personal care products, nootropics, medicinal mushrooms, healthy fats, collagen supplements and bone broth, all of which may appeal to individuals striving for purposeful ways to protect or improve their overall short- and long-term health. Some popular trends from recent years have now become movements, as manufacturers strive to provide natural, healthier products driven by consumer demand. Plant-based diets, sustainable food sources and holistic land management remain high in importance for those looking for measurable ways to support their own health as well as the health of the planet and all its inhabitants. High-Intensity Interval Training (HIIT) – HIIT was number one in fitness surveys in 2018 and has been in the top five since 2014. This time-saving, extremely popular program typically involves short bursts of high-intensity exercise followed by short periods of rest. Fitness programs for older adults – As people are looking to protect their long-term health and quality of life, many gyms offer classes specifically geared towards older generations. In the top ten since 2007, fitness programs for older adults was in position number nine in 2018. Body weight training – Body weight training involves essential movements such as squats, lunges, push-ups, pull-ups and planks, as well as jumping exercises. These effective strengthening exercises utilize multiple muscle groups, burn calories and provide a great cardiovascular workout. No special equipment or gym membership necessary. Yoga – Once considered an alternative form of exercise, many styles of this mind/body practice have gone mainstream. A combination of breathing exercises, physical postures and meditation, many enjoy the relaxing and balancing benefits of yoga, as well as the challenging poses. Trending over the last ten years, the popularity of yoga is expected to rise even more sharply in the coming years, as science continues to illustrate the many benefits of the practice. Outdoor activities – As people long to get back to nature, organized outdoor group activities, such as walking, cycling and hiking have become very popular. Often planned by a fitness professional, these activities may be short events, daylong events or planned weekend hiking/camping excursions. Corporations that sponsor outdoor team building activities find that outings help relieve stress and lift team spirits, as well as create a general sense of healthy teamwork and competition, as well. CBD and the endocannabinoid system – As more hemp-derived CBD products hit the market, we may be learning more about the body’s endocannabinoid system (ECS). The endocannabinoid system is central regulatory system that affects a wide range of biological processes, including the stress response and hormone secretion. Cannabinoid receptors, located largely in the central and peripheral nervous systems, bind with the body’s own natural endocannabinoids, as well as phytocannabinoids found in CBD. Through these receptors, the ECS helps to regulate glucose metabolism, mood, sleep, memory, pain perception, pleasure/reward, immune function and more, aiding homeostasis and influencing many aspects of health and wellness. Circadian rhythm – As people become more aware of the importance of sleep to hormone regulation and overall healthy function, many are striving to get more in touch with their own personal circadian rhythms. Natural factors within the body produce circadian rhythms, which respond to signals from the environment, such as light as darkness. Irregular rhythms have been linked to various chronic health conditions, such as sleep disorders, obesity, diabetes, depression, bipolar disorder, and seasonal affective disorder. Maintaining a consistent sleep/wake cycle is one of the best ways to reset the circadian rhythm, positively affecting sleep quality, energy levels, productivity and mood. Brain health – As the population ages, public awareness of the fundamental role of lifestyle modification as it relates to brain heath and reducing the risk of cognitive impairment is increasing. The brain receives nourishment strictly though the foods we eat daily. Therefore, cleaning up the diet appears to be our strongest defense against dementia and Alzheimer’s disease. Experts advise eating a wide variety of colorful fruits and vegetables that contain plant pigments such as carotenoids, and anthocyanins, antioxidant compounds that protect against oxidative stress and cellular aging. Taking a break from overexposure to technology and placing more focus on physical activity, nature and socialization are additional lifestyle strategies that support brain health. Nootropics, such as lutein, bacopa, magnesium threonate, phosphatidylserine, L- theanine and vitamin B1 are often used to boost, memory, focus, motivation and creativity. Planetary health diet – Recommended by functional medicine physicians, nutritionists and the World Health Organization (WHO), a largely plant-based diet supports the long-term health of people and the planet. Sustainable diets have low environmental impact and provide safe healthy nutrition, while optimizing natural and human resources. Based on extensive research, a flexible dietary pattern, that consists of vegetables, fruits, whole grains, legumes, nuts, healthy fats, a moderate amount of seafood and poultry, and little or no red meat, added sugar, refined grains and starchy vegetables, provides major health benefits including a longer, healthier lifespan. Ultimately, our food choices impact more than just ourselves. A primarily plant-based diet is seen to protect human health, as well as the health of our environment.